Moving dirt, boulders, gravel, concrete or plants – it’s all done much more efficiently and effectively with a wheelbarrow. If you’re dealing with shovels, chances are you are moving material from point A to point B. Short of having a Bobcat handy, or one of those fancy-pants motorized wheelbarrows from Makita seen below, you’ll want a good old fashioned wheelbarrow. A wheelbarrow makes moving material over most terrain much more efficient. I used my ancient wheelbarrow to transport dirt (a LOT of dirt), gravel, small-ish boulders, decomposed granite, broken up concrete, plants in containers, plants headed for the compost pile, and mulch. It has even been the mixing vessel for some small batches of concrete. Ideally, I’d recommend a model that has a single, flat-free tire and wheel in the front. This means not having to worry about filling up or replacing the tire regularly. The single wheel in front makes the wheelbarrow much more nimble to navigate. I ran mine across planks and through narrow passages regularly, and those things are just tough to do with a couple wheels in front. I also vote for steel over plastic or poly – I’m pretty sure I would have cracked/destroyed anything other than steel at this point. 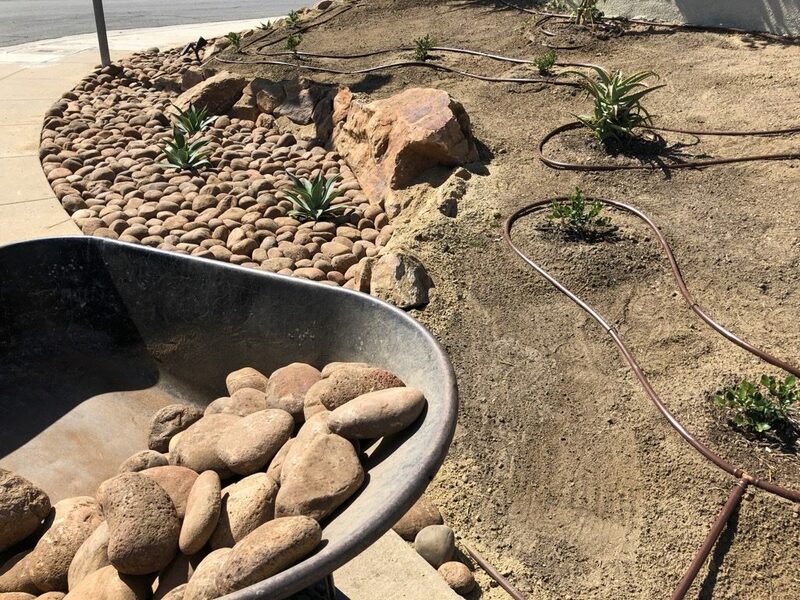 One of my first tasks in our epic re-landscaping project was removing agave and sugar cane plants from a narrow planter by our driveway. The planter was flanked with concrete, making digging around the plants impossible. This meant I had to attack the plants from two side only rater than from 360 degrees. 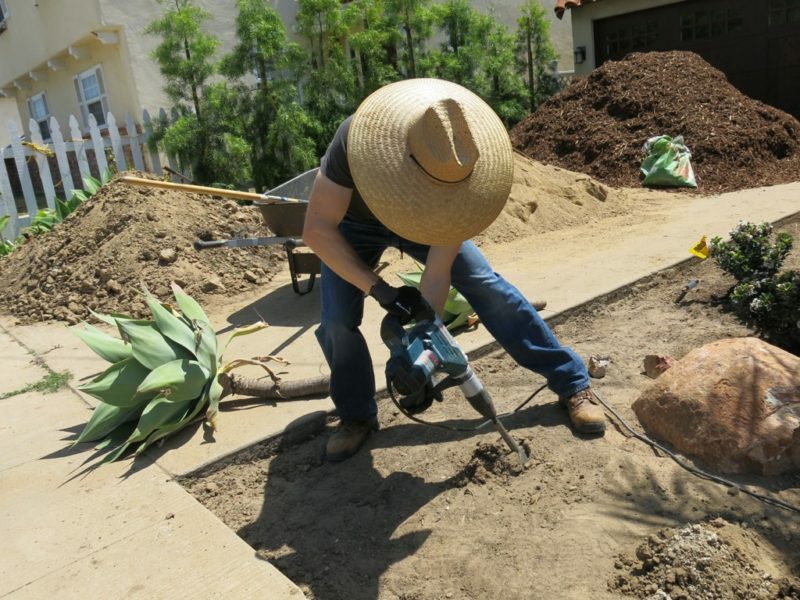 The landscaping tool / weapon you’ll want for intense digging, breaking up stubborn soil in small areas, and for some prying is the San Angelo Bar or a digging bar. The San Angelo Bar tends to look like a javelin that Hercules might toss around, whereas a more typical “digging bar” will have the equivalent of a mini shovel at one tip. 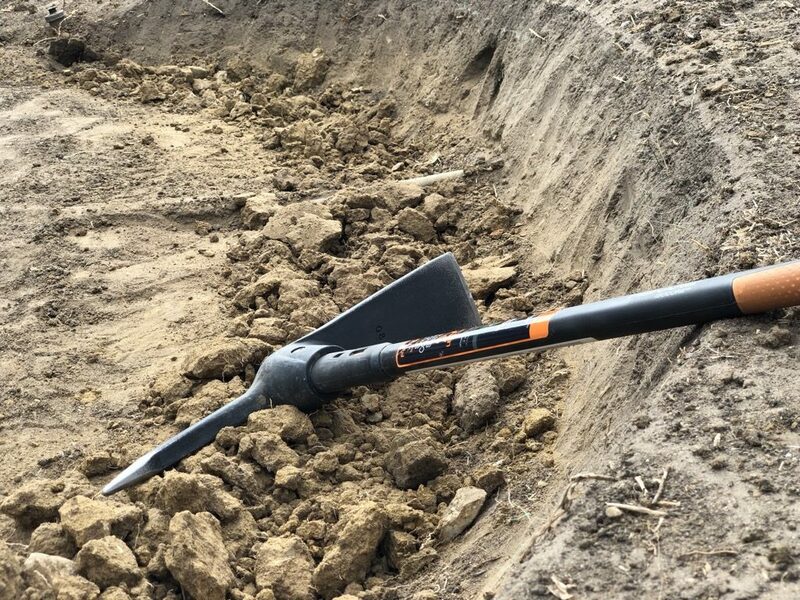 The tips on whatever variety bar you get can range from spear-like “pencil point” to a small tamping head for tamping soil in small areas like a post hole. The San Angelo bar I used was invaluable for helping me excavate in and around plant roots in a tight space. 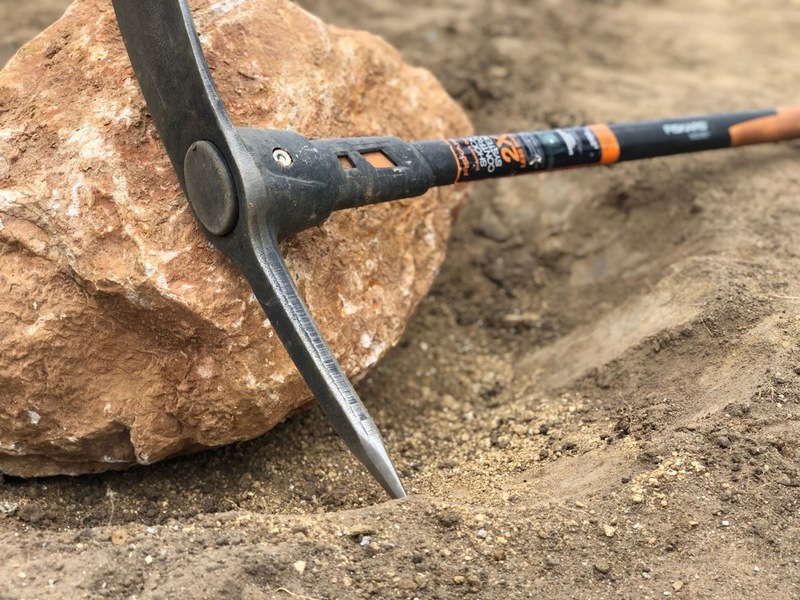 Due to their heft and length, you can also get a lot of leverage when prying out stubborn roots, rocks, etc. They are also popular tools for assisting with digging post holes. I even used mine when finessing a few boulders into place. Just make sure you keep a grip on the bar – you do NOT want one of these flinging back in your direction. You know that feeling when you’re digging and your shovel just glides effortlessly into the soil, and you scoop it out like powdered sugar? Yeah, neither do we. Despite living in an area known for loam soil (a mixture of sand, silt and clay), I managed to find many portions of that soil that did NOT want to be disturbed. A shovel literally was not going to cut it. This Fiskars pickaxe was reached for frequently – whenever the stubborn soil was resisting my attempts to shovel, trench or carve it. This is a great time to bring out the pickaxe, which I used to loosen up soil for trenching irrigation lines. I also used it to carve out recesses for boulder placement. And it came in handy when digging out a few particularly stubborn plants that did not want to give up their tenacious grip on our supposedly sandy soil. A mattock looks very similar to the pickaxe, but it has a small axe blade on one end and a broader adze-like blade on the other. I actually wished I had a mattock on-hand a few times as they can be very handy for chopping away at roots that are too thick for the root cutting shovels mentioned above. Sometimes even a Pickaxe is like using a small wood chisel to chop down a giant tree. You might get the job done, but it will take you forever and you’ll probably destroy yourself in the process. 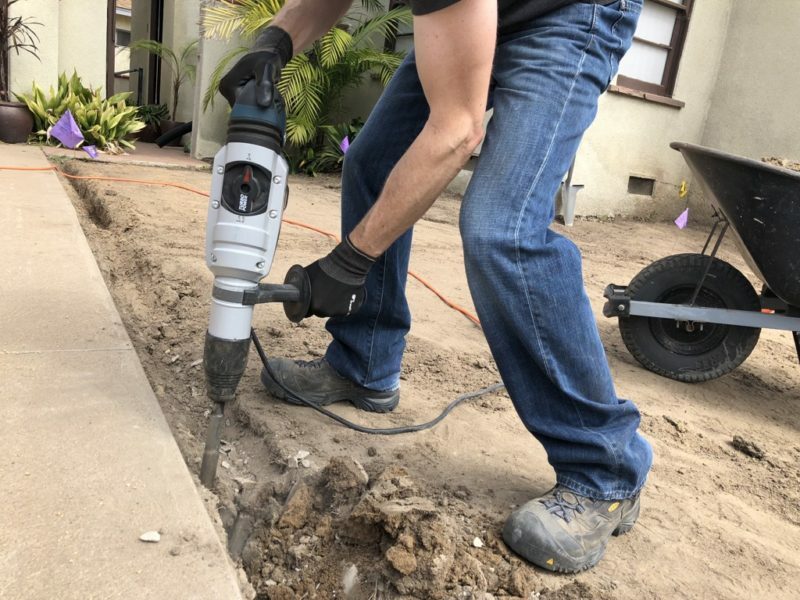 We recently talked about the difference between SDS-Plus vs SDS-Max tools, and when it’s time to reach for a full size jackhammer. Unless you live in a mystical place with soil that is like powdered sugar, a moderately sized SDS-Max tool with a spade bit is worth its weight in gold. 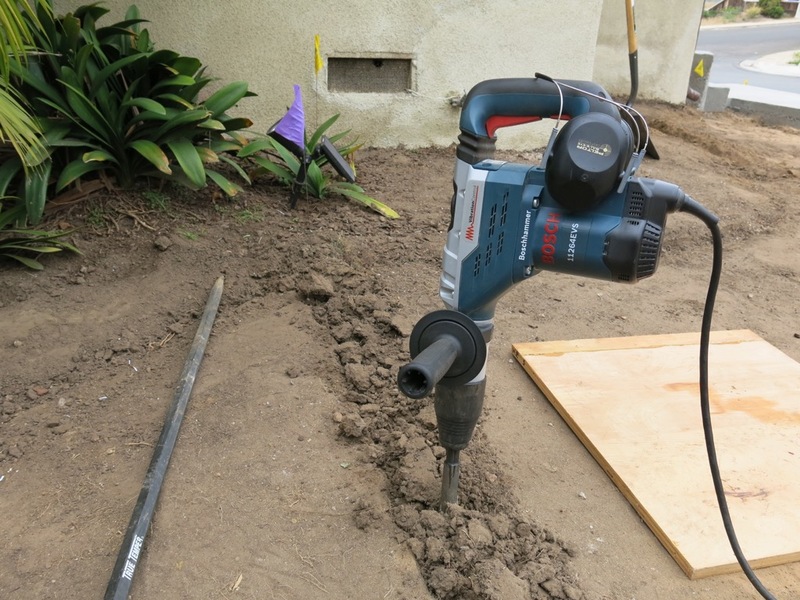 Prepping to dig an irrigation line trench with some extra muscle from this Bosch SDS-Max Rotary Hammer and spade bit. When I encounter soil that doesn’t cooperate immediately with my manual shoveling, I don’t waste any time deploying my beloved Bosch SDS-Max with a spade bit attachment. You can find SDS-Max tools sold as drills / rotary hammers as well as demolition hammers. The demo hammers area a good choice if you don’t plan to do any drilling with the tool. Whatever you choose, pick a model that has anti-vibration features to help protect your hands and arms. Here, I’m propagating some Agave in unspeakably hard soil. A couple angled holes were excavated with relative ease thanks to this SDS-Max tool and spade bit. Sometimes landscape work is a lot like neatly raking gravel in a zen garden, only a LOT less peaceful. While garden rakes are handy for things like tidying up fallen leaves, they just don’t cut it when raking soil and gravel. 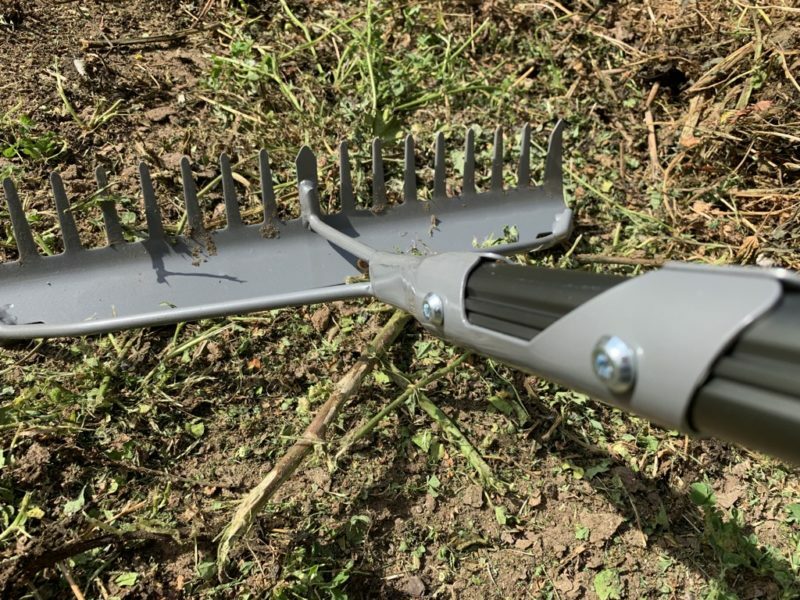 For that you will want a metal rake in your landscaping tools arsenal. Most of these have heavy wooden handles and a steel rake attached to the end. Getting my zen garden on with an indispensable garden rake. Fiskars sent us a couple metal rakes, including their new Pro model. We used their normal version extensively and honestly expected it to break almost immediately. It is incredibly light which I assumed would mean an early demise. However no matter how hard I yanked on that rake, it clawed its way through rocky soil, roots, and weeds without complaint. After months of daily abuse, it is still in one piece. Fiskars new Pro garden rake – while a heavier tool, it’s definitely designed to tackle heavier duty landscaping tasks. 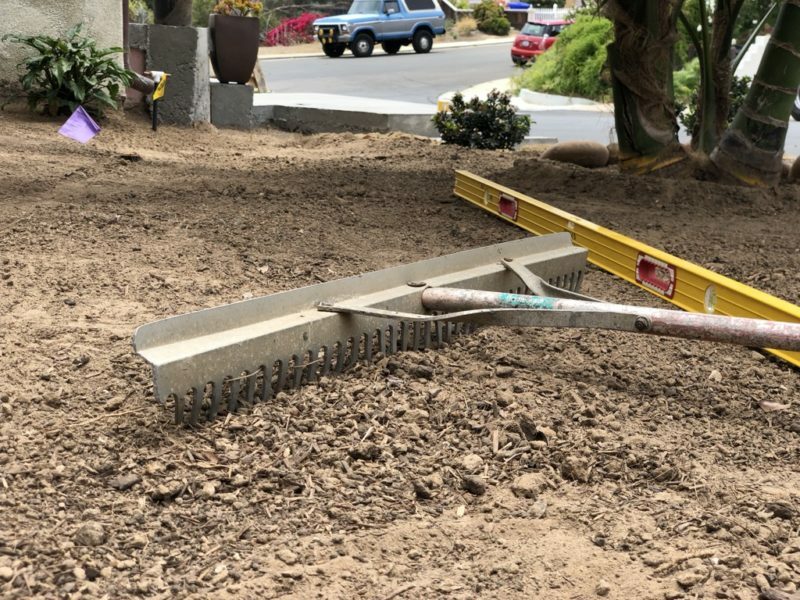 Metal rakes, and more specifically, landscaping rakes can also come in very handy for leveling out areas. This applies to sand, decomposed granite or even some gravel. 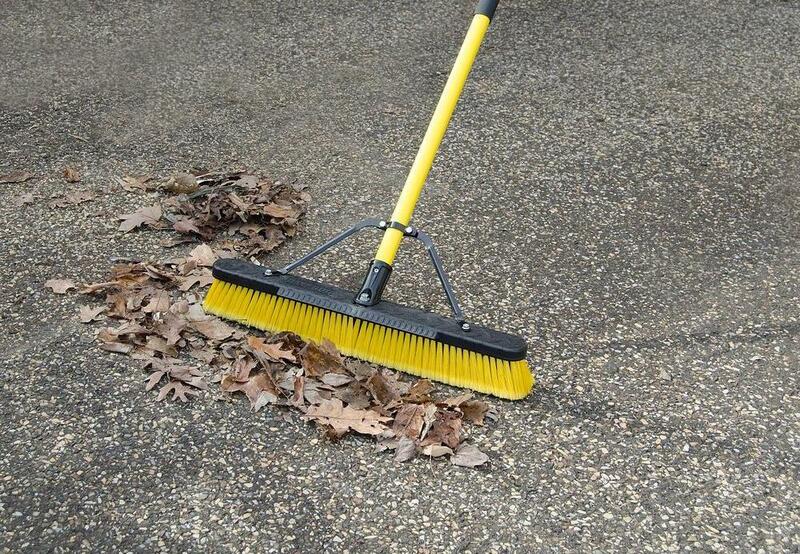 If you’re tackling a small area, a typical metal rake works great. However if you are leveling out a large expanse I found a very wide landscape rake to be a worthwhile investment. They are basically like a very wide metal rake, but they have a flat edge as well to smooth out the material as you level it. These rakes tend to have aluminum tines on them, so don’t try to use them for ripping up your yard. 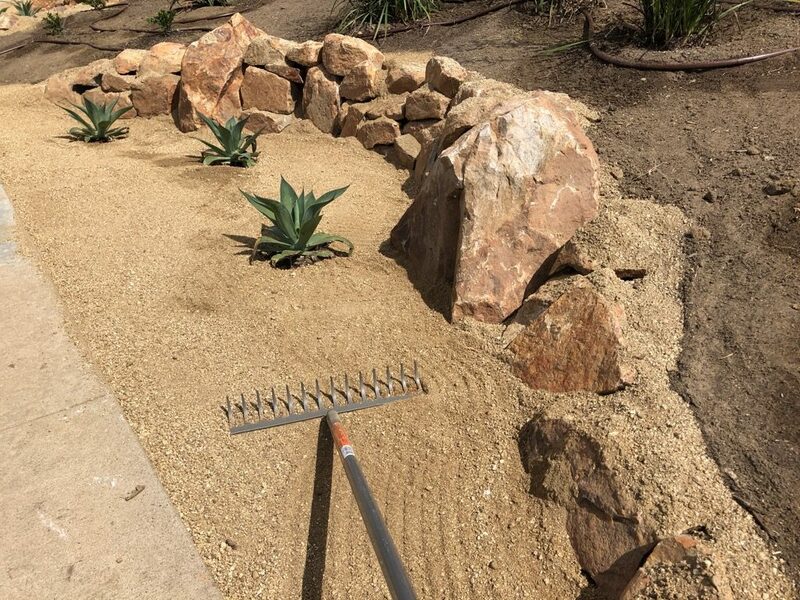 If you’re grading a large area, a wide landscaping rake like this one is just what you need. Woohoo, you are done toiling on your yard for the day, congrats! Wait a sec’, not so fast. Now it’s time to tidy up before the neighbors complain (more). Sure, you could clean up the driveway, patio or sidewalk with a normal broom. The only problem with that plan is it will take you about twenty times as long as it would with a decent push broom. Push brooms have different bristles and widths designed for different tasks. Shoot for about a 24″ wide push broom, with bristles designed for heavy outdoor use. 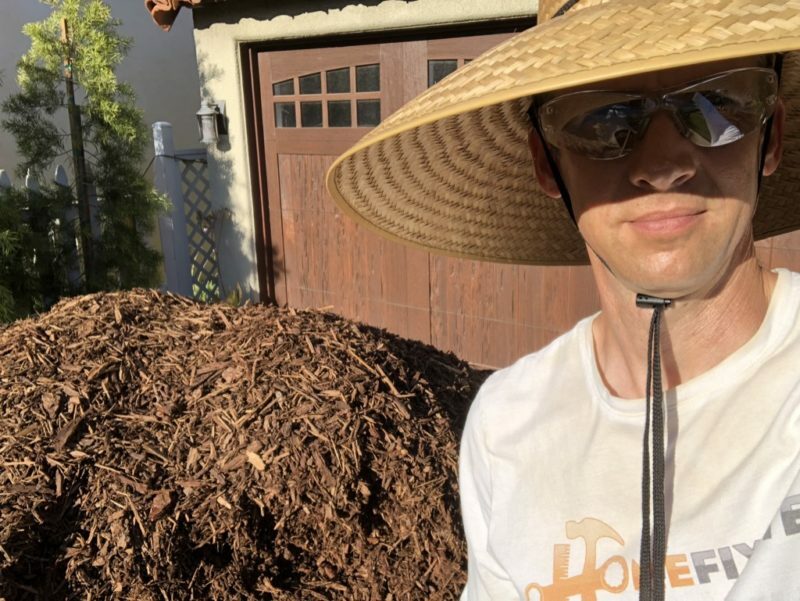 Until they make a Roomba for your hardscape, the push broom is your next best bet for a tidy jobsite or yard, without much effort. You can have neighbors that complain (less) with a meager investment of about $30 with a push broom like this Quickie model. In landscape work, moving things with your teeth or feet is quite ineffective. 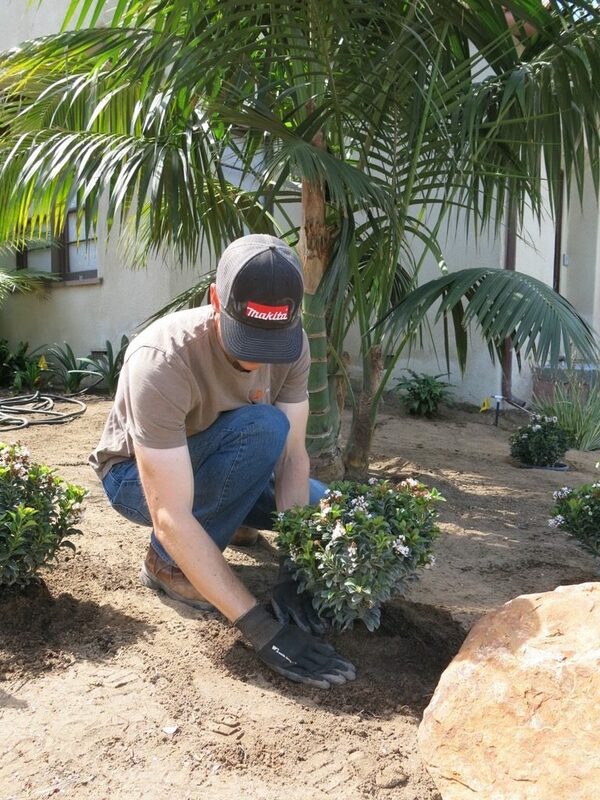 As a result, most people use their hands extensively when landscaping. I also discovered relatively few landscape tasks that can be done quickly. 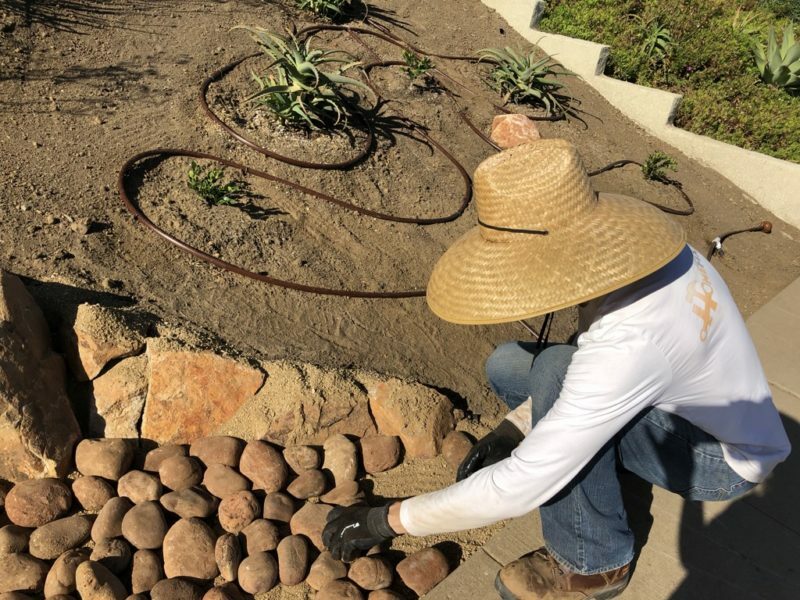 All this means you’re likely to spend many hours with your hands wrapped around several of the landscaping tools documented throughout this article. These partially dipped nitrile / nylon mesh gloves are my go-to for many landscaping tasks. Tools come down to personal preference and what is the best landscaping glove depends a lot on the type of work you are doing. Most of the time I shifted between a synthetic glove and a cloth, partially dipped semi-disposable glove. You’ll see many all leather gloves on the market, but I find them too hot and their loose wrist opening seem to attract dirt INTO the glove rather than keep it off my hands. 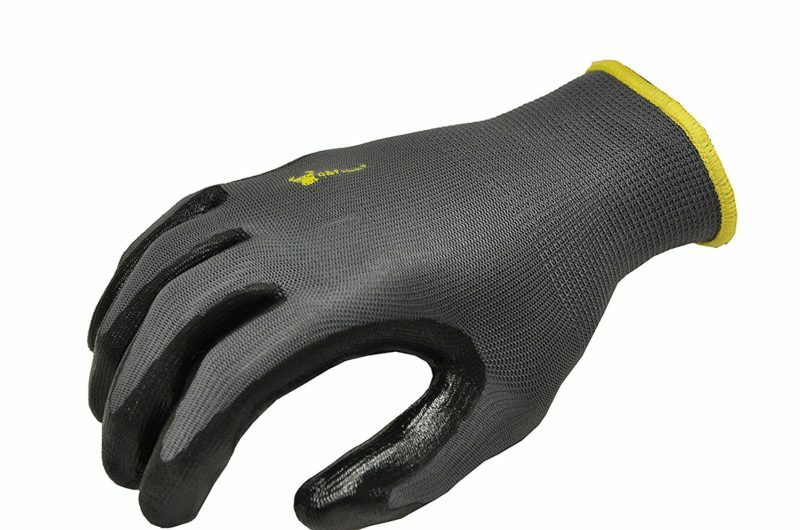 The elastic cuffs on these partially dipped gloves made them a great choice when working around dirt that normally finds its way INTO normal garden gloves. Whatever glove you choose, I recommend something with a minimum of seams and that fit you comfortably. Poorly fit gloves, or having seams in all the wrong places can quickly invite blisters to form. I found the partially-dipped gloves were good for grip, general protection, and their knit cuffs kept the dirt and debris out of my gloves. Stay away from 100% latex / nitrile gloves unless you want minimal protection and maximum sweat. My preferred sun protection most of the time – a cheap lifeguard hat which provides a lot of shade. Hi, it’s your mom speaking. Don’t forget to put on sunscreen AND wear a hat! I get it, sometimes wearing a hat just doesn’t seem appealing. And, when it comes to hats for sun protection, some can get rather geeky. 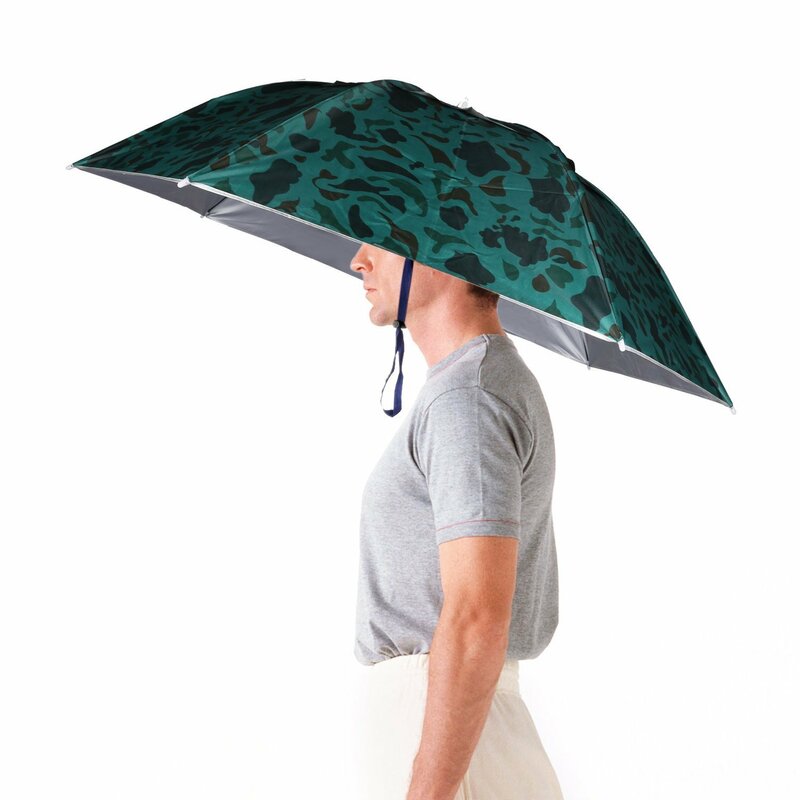 Our favorite in that category is this Luwint gardening “hat” we found on Amazon. Even when you’re not wielding power tools, good safety glasses will help keep dirt clods, gravel, dust or rock chips from seeking out your eyes. Although you wouldn’t know it looking at some gardens, it turns out seeing what you’re doing is pretty important. I value my eyesight and made a habit of always wearing eye protection of some kind. Even a task as simple as digging or pruning can send a wayward chunk of dirt or swinging branch into your eye. A cloud of dirt dust can be at least partially thwarted with a good pair of safety glasses. Since you’ll be outside, have both a tinted and clear option readily available. Last but not least, you don’t want to take on a landscaping project in your loafers. When you are trudging through dirt all day, stomping on shovels and rolling rocks around, having good footwear is vital. I favor boots over low-rise models to better keep dirt out of where your little piggies reside, and for better ankle support. Good boots like these KEEN Utility boots are vital for long days spent landscaping. We are fans of several of the KEEN Utility lineup. The boots we have tested tend to be extremely durable, protective and actually waterproof for when things get sloshy. Most of their boots are in the $100-$200 range, and models for both men and women are available. You might even buy your significant other a pair as a subtle hint and then see if they help you in the yard. Hey, it’s worth a shot! This list doesn’t cover everything you’ll need, but with these essential landscaping tools you’ll be well on your way to tackling most projects. Naturally, there will be hours, days, weeks, (in our case, months) of backbreaking manual labor too. Hopefully in the end you’ll have a garden and landscape you’re not only proud of, but that contributes to the beauty and utility of your home. If you have any favorite landscaping tools, please mention them in the comments below. We might even feature them in a future Home Fixated review or article. Happy landscaping in the meantime!